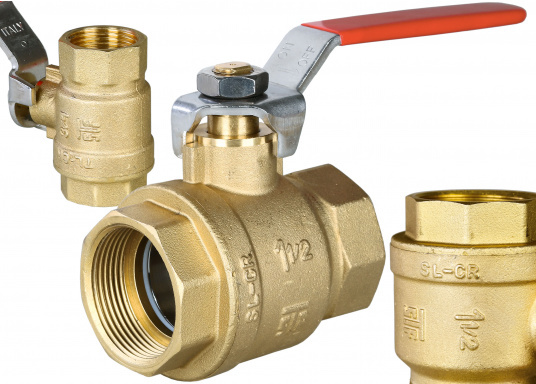 Full bore ball valve. Housing made from brass CR. Available in different sizes. 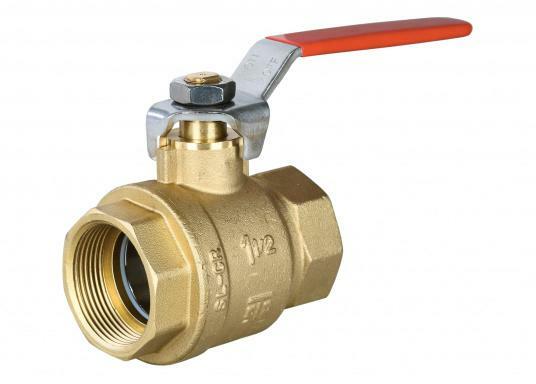 Full bore ball valve. Brass CR. Available in different sizes. For decades, brass (MS588 Neq: CW617N) has reliably served on board. its corrosion resistance is decent, when one polishes it with regularity. In underwater applications, MS58 can achieve the standard five years of funtionality, which the EU demands, as long as it does not come in to contact with any electrolytic reactions. Electrolytic reactions can cause dezincification, whereas zinc becomes flushed out of the brass alloy, which in turn allows the remaining copper to become brittle. The solution to this problem has been known for years: DZR brass (dezincification resistant), trade name CR (corrosion resistant) or CW602N. The CR-brass has tiny amounts of heavy metals added in with its copper content at 63%. This specific alloy significantly prolongs the lifespan of board feedthroughs, water inlets and thruhalls. Although CR-brass is rather expensive, we always recommend its use in underwater applications because dezincification can take place in any body of water, even on rivers and lakes. However, this problem is fairly easy to spot. After removing the layers of paint and oxidation residue, a pink discolored material will remain: this is the copper from the original alloy. If you discover this on your vessel, you should replace the affected components. Ich suche ein gutes Seeventil mit 1 3/4 Zoll Durchmesser. Das Schiff ist eine alte HR 312. Ihr Sortiment hat hier eine Lücke (?). Wenn Du den Kugelhahn nicht wirklich in der Hand hältst, dann würde ich sagen, diese Größe von 1 3/4" ist nicht handelsüblich. Wenn ich mir die Abmessung vorstelle, das ist ein echter Brummer für solch ein kleines (Entschuldigung) Schiff. Da schliesse ich mich der Antwort von Arno an. Schau nochmal nach, ob es sich ggf. um 3/4 Zoll handelt. Selbst das Seeventil für Toilette Aussenbords hat in der Regel „nur“ 1 1/2 Zoll. Ein 1 3/4 Zoll Seeventil habe ich noch nirgends gesehen. Aber die Kugelhähne von SVB (Messing CR) sind konstruktiv gut ausgeführt und qualitativ hochwertig/langlebig.